June 5th provided little wind. Sailboat! June 5th brought a nice group of friends down to the boat, but they didn’t bring any wind with them! 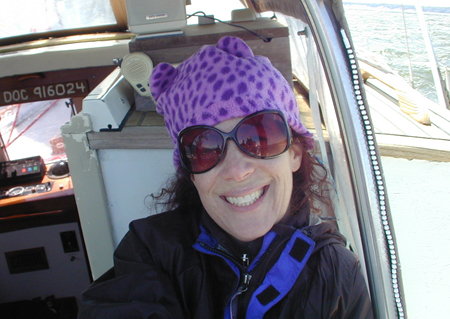 It was a sunny day, pretty humid… Sailing on Schooner Heron works better if there’s some good wind. Or any wind at all! 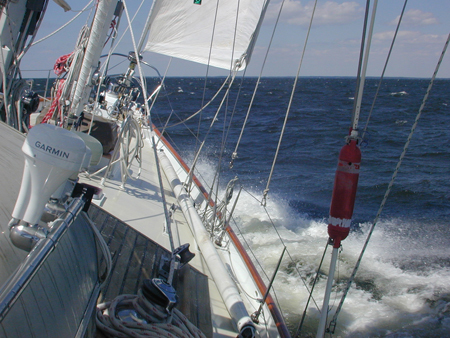 Well, there was a little breeze, now and then, and we made some headway out into the Chesapeake Bay, but this wasn’t like a few of the more exciting day sails we’ve had so far this season. I would love to be able to promise perfect conditions, every time, but alas, I don’t have those powers. Still, we did move about a bit, and Sean did a good job at the wheel. 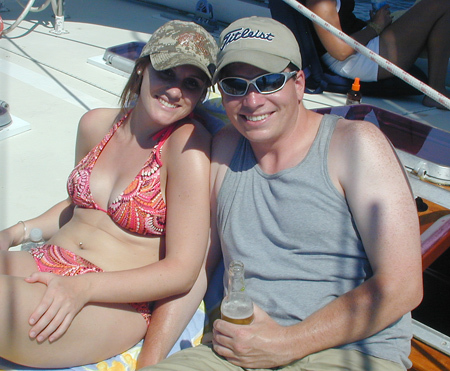 But, that didn’t stop these folks from having a great time and enjoying their time together on the Bay. Look at this photo and tell me if I don’t have a great job! The flush deck of Heron provides a lot of room for people to spread out and be comfortable. With the sails up, there is usually a sunny side of the deck, and a shaded side, so you get to choose. The broad flush deck amidships also turns out to be quite a good dance floor, as we found out. Several of these friends belong to a Cuban dance group, and Eric and Christine got up and showed us their moves to some music by Putumayo. As usual, the food was good and enjoyed by all. Here Diana is handing out some goodies. 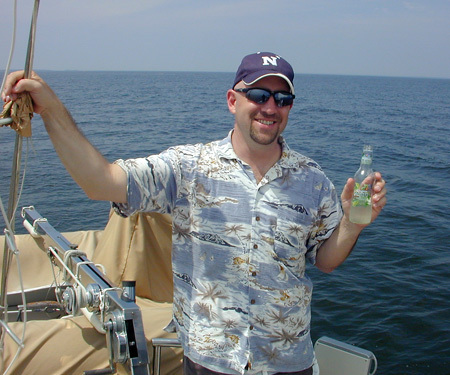 I’m not sure why that is, but things in general seem to be enjoyed more on a boat. A fresh shower on a boat, for example, seems so much more refreshing than stepping into your shower at home. Why? Don’t know. You even have to conserve water, so you wet down, shut off the water… do your hair, rinse that… then wet down your body and shut off the water… then soap up and quickly rinse… You don’t have the luxury of running hot water over your body for twenty minutes, but for some reason, after you’ve been working the boat all day, sweating in the sun, or swimming in the salt water, a boat shower with warm or cool fresh water at the end of the day really sets you right up. Same with food. Maybe it’s the expectation that “it’s a boat” so you won’t have good food. But, I’ll tell you, I can cook a helluva great meal on my propane stove in the galley, or on a grill hung over the stern pulpit. Add a little good wine, some candlelight… and voila! You have a great meal while sitting at anchor somewhere beautiful, with the sun setting… the birds settling down for the night… and the stars popping out by the time you’ve finished your meal and come up on deck. But, I digress. 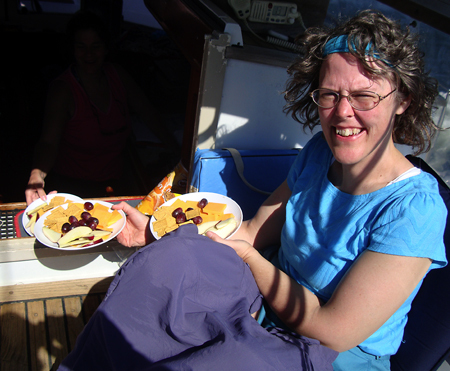 During our charter daysails, I provide the fixin’s for sandwiches, snacks, and softdrinks, and I contact you before the sailing day to see exactly what your preferences are for coldcuts, breads, etc. 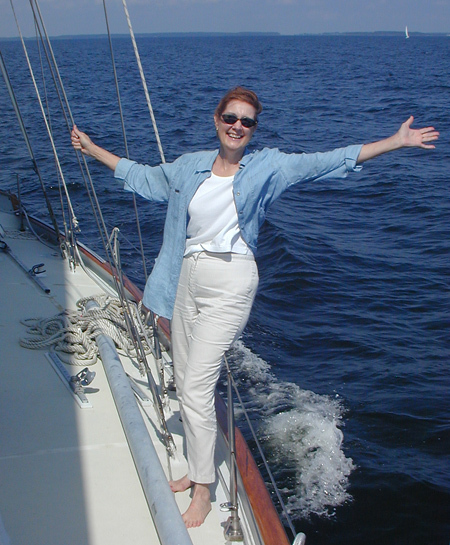 So, on board during your sailing day, you get exactly what you most enjoy… and I call that having a good time! 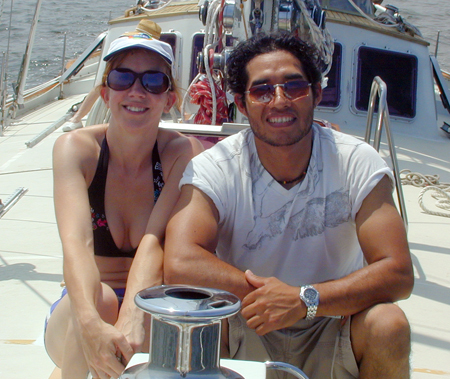 Dr. Kim (PhD in Wildlife Ecology and Management), here with friend Ronaldo, brought this group of friends together for a charter. They dance together, go out together, party together… so why not sail together? They were a great bunch of folks and I appreciate her efforts to make the charter day happen. It was a hot day, and it was important to stay hydrated. Eric worked hard at that… all day long! All in all, it was a really nice day. 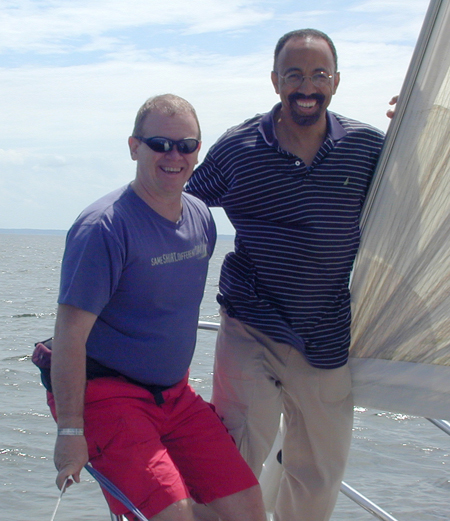 More wind would have been better, but that’s sailing on the Chesapeake. If you want to get someplace fast, go on a powerboat. But when you’re sailing, you sort of take what you get and make something out of it. 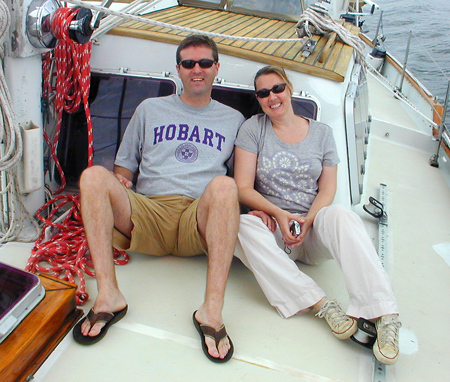 We took the gentle breezes that were out on the Bay and made a great time of it. I enjoyed meeting everyone who was aboard this day, and I hope to see them all again sometime soon. May 30th brought light airs, but a good time! Tim Young brought his family and a couple of friends down to Solomons Island for a charter aboard Schooner Heron on a day that provided fairly light air. It was the kind of summertime day that turns white skin pink, so we had to be careful about that. Tim spend most of his time at the wheel, and we managed to have at least three hours where the boat moved well through the water. 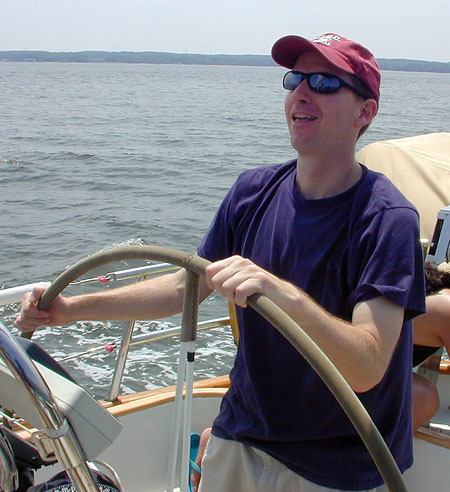 Tim is thinking of joining the ranks of “boat owner,” so we enjoyed chatting about different kinds of sailboats, pros and cons…It’s pretty exciting to go out, looking for a boat. 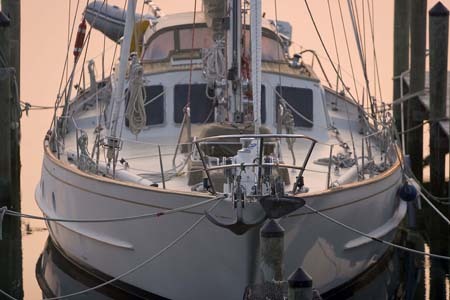 There are so many options, so many offerings, when looking at sailboats. More interior space, less interior space, better sailing characteristics, sacrificing sailing characteristics for more creature comforts… Where will you be sailing? Around the world? Around the Chesapeake Bay? Up and down the coast? Down the Islands? There is lots to think about and take into consideration before taking the plunge. And of course, no matter what you buy, you’re always thinking of your next boat! 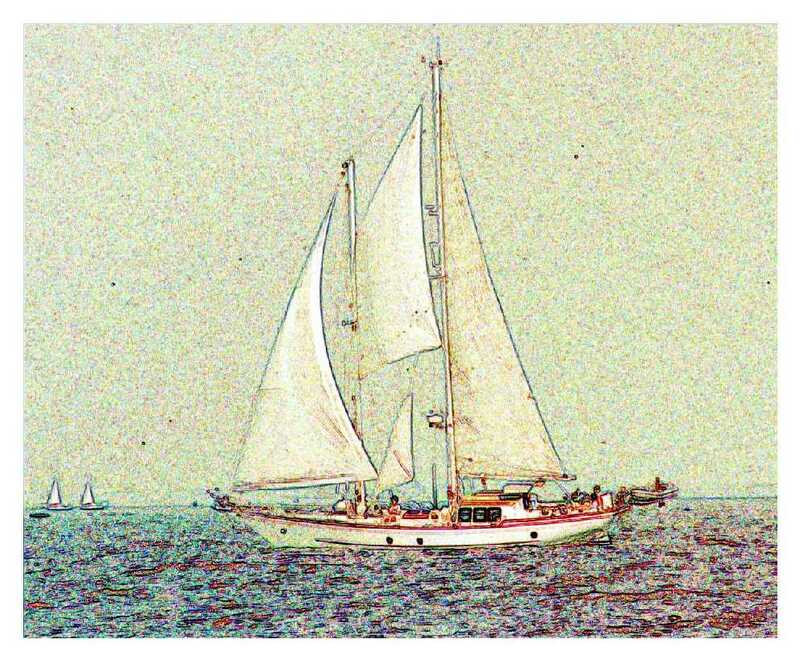 But in my case, I think I’ve settled down with my schooner, Heron. I’ve owned her for about 14 years, and I can’t think of another boat I’d like to have over her. What can I say? I’m committed. Tim’s wife Zoraida is from Panama, and it was very interesting chatting with her. She’s wicked smart (can you tell that I’ve lived in Maine? ), an engineer, and full of surprises. 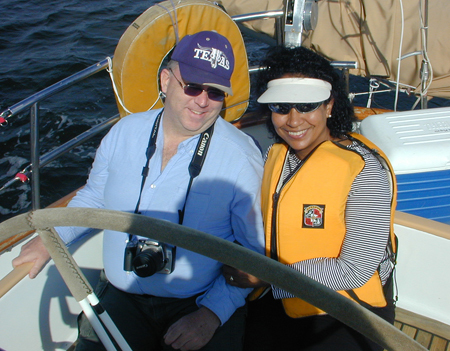 And, she was a bit of a hero during the charter, but it had nothing to do at all with her noticing another boat close ahead of us while one of us (it wasn’t me, it wasn’t Jennifer, it wasn’t Tim, it wasn’t Michelle, and it wasn’t Zoraida…) was at the helm. 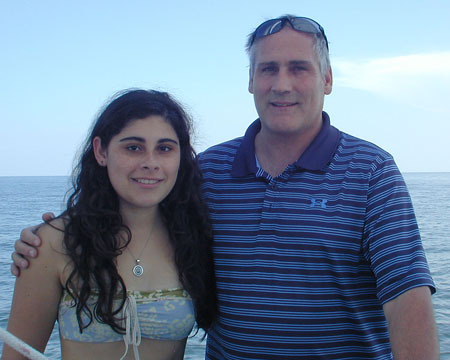 Tim’s daughter Jennifer and boyfriend Dan were aboard. 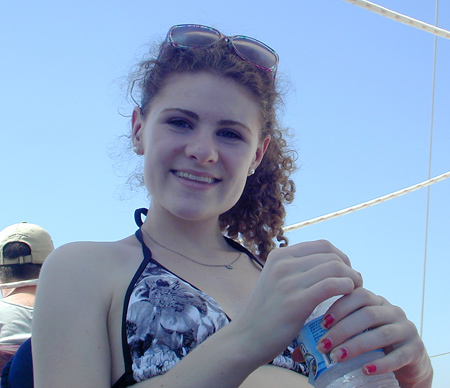 Jennifer was also wicked smart, and totally into her career, working towards becoming an occupational therapist. She’s just finishing school, but has been working with challenged children already, for a long time. What a pleasure to see a young person doing such fine work, helping others in such a big way. Dan, the Man… doing marketing and planning at Lansdowne Resort near Leesburg, VA… He really enjoyed himself on the boat, even though, as I said, we had light airs. When the wind picked up and we started moving along nicely, he really got into it. I asked him, as one point, “Where is the beach?” This was his reply. 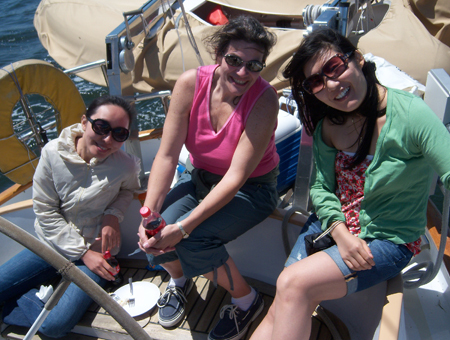 Once again, the daysail was a good way for family and friends to spend time together. Daughter Michelle brought her friend Leanne, and the two hung out together for the day, stopping rays. Leanne was VERY white at the start of the day, but she slathered on plenty of sunscreen and went home sporting a mild pinkish color. And for me, another chance to meet and hang out with some really nice folks. What can I say? I guess the whole concept of a relaxing, personalized, charter aboard a beautiful boat like Schooner Heron really pulls the nice folks out of the woodwork. I’m just enjoying myself meeting interesting and friendly people from all walks of life, all ages, with different backgrounds… and what are we doing? 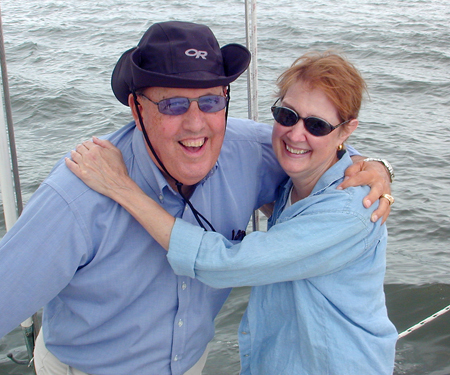 We’re going sailing on the Chesapeake Bay! Whoo Hoo!!! Really nice conditions, and a really nice family! 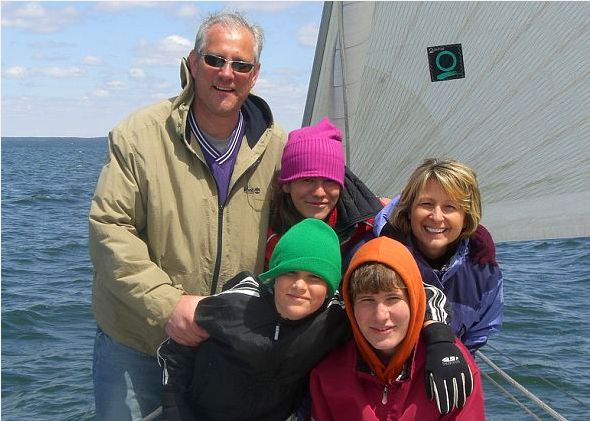 Once again, a daysail charter on Schooner Heron proved to be a really great way for a family to spend time together. 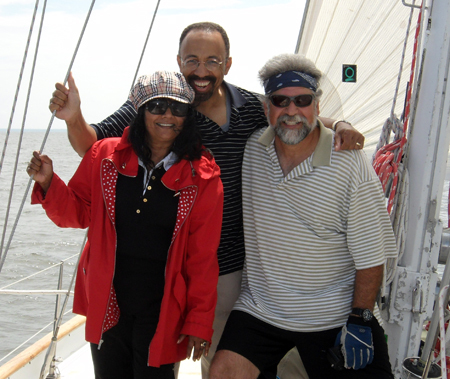 Whatever is going on back at home, all the trials and tribulations of life that we all have… they’re all left behind while we share a sail on the Chesapeake Bay aboard Heron. Don’t get me wrong. 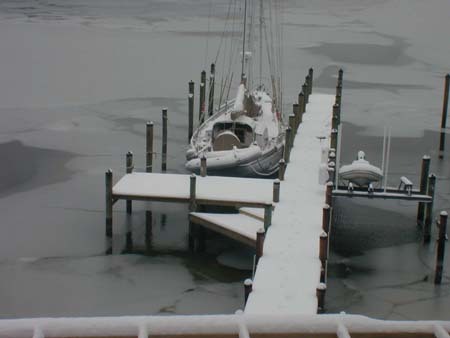 “It’s” all waiting for you, when you get back to the dock. But, for those five or so hours that we’re off and running, you’re able to simply luxuriate in the natural world around you, and spend really good time with the people you care most about. It was a pleasure for me to see Charles Jeffress again. 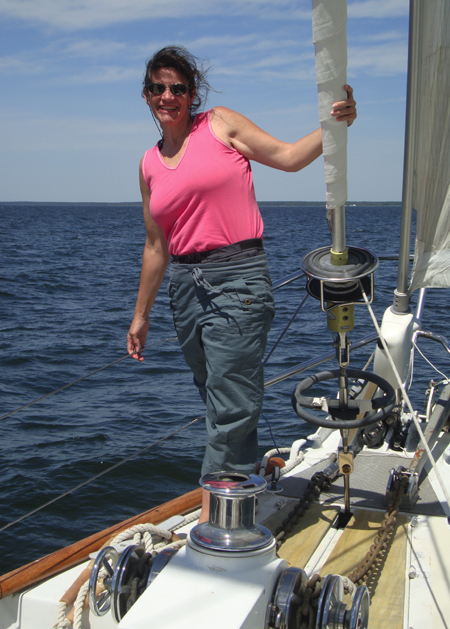 Charlie had booked a seat aboard Heron for last year’s Great Chesapeake Bay Schooner Race. At the last moment, for personal reasons, he had to bail out. But, he said, “I’ll be back,” and true to his word, he booked a charter for his family on May 29th. It was really nice for me to spend time with his lovely wife, Jean, whom I had met briefly last year. She certainly enjoyed the sail, and enjoyed watching her family spend the day on the water together. Daughter Ashley and husband Peyton joined in, and I was quick to put Peyton to work, helping to get the main sail up. It’s great to have help running the boat. He was breathing a little hard when I took this photo. Son Berkeley found it easy to relax with such ideal conditions. That “front seat,” as I call it, is such a great place to hang out. If only it had a little more padding. 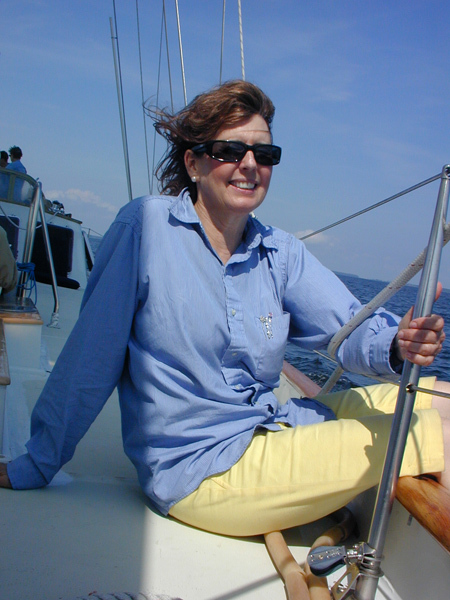 And Charlie’s sister Elise joined the group for the sail, right at home on the boat, as she spends half of her time up in Martha’s Vineyard and is no stranger to the world of boating. It was a lot of fun to spend the day with her, as she brought a lot of energy and enthusiasm along for the ride. Every second, she was helping out, running all over the boat. I was able to catch her during a few moments of relaxation for this beauty shot. We all made it through the wonderful day, nobody fell overboard!, Charlie even got in a good snooze on deck. Another good charter on Schooner Heron. 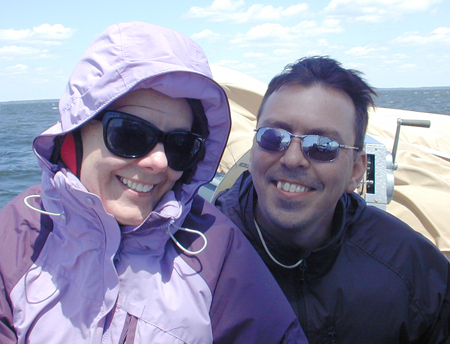 Rescheduling from a previous weekend, Steve and Lara and friends came down to Solomons Island, in Calvert County, Southern Maryland, for a sailing charter aboard Schooner Heron on a day that started out chilly, stayed chilly, and had more than enough wind to go around. But, they were prepared, with lots of warm layers, ear muffs, gloves, hats… The day turned out to be quite exhilarating. 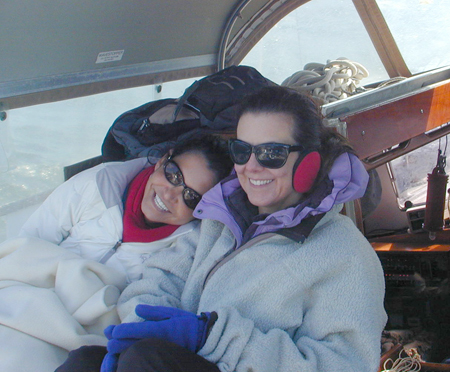 Here, Catalina and Lara are huddling to stay warm. 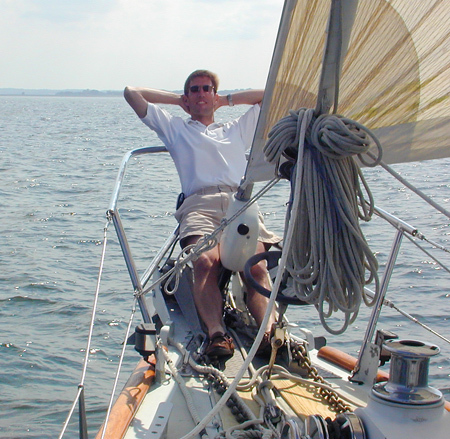 One of the most important features of a sailboat is the ability to reduce sail as the wind increases. Reducing sail means to put up smaller sails, reef the mainsail (make it smaller, by lowering a bit of it and tying that off), or in the case of furling sails (which roll up on themselves like a windowshade), to roll them in a bit. 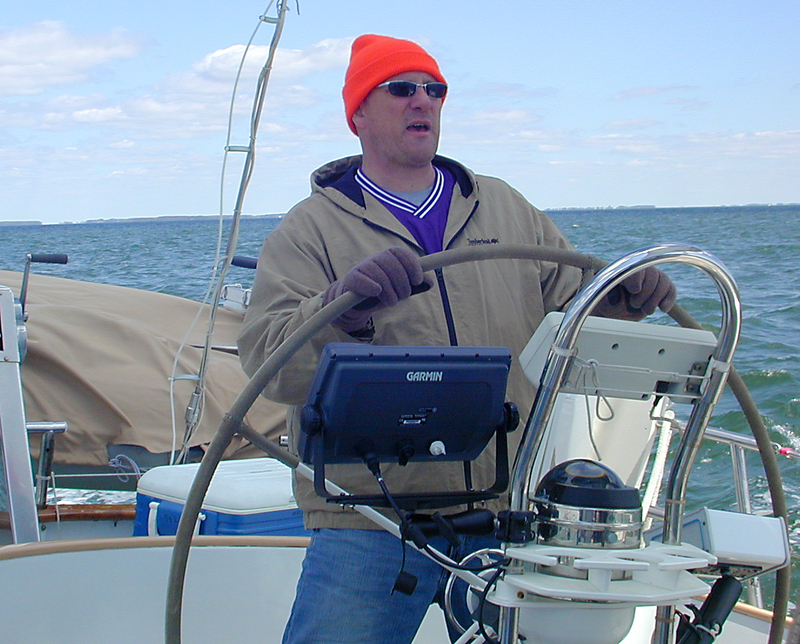 Keeping the boat balanced, by adjusting the sail plan so you have the pull of the sails, the “effort” balanced between the front sails and the back sails makes steering the boat much easier. With a schooner rig on Heron, because we have two masts and a wide variety of sails, it is easy to keep the boat balanced and comfortable. Here, Nelson is hanging on, doing a great job at the helm. 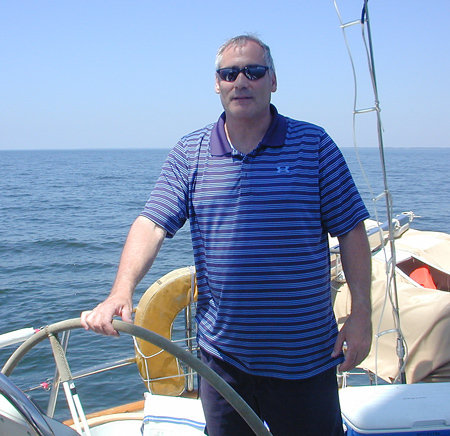 Nelson has experience racing on small boats, and he has a great feel of the water. Another point to consider, with sailboats, is that as the wind increases and the boat begins to heel (this is when it gets to be fun! ), the wind is spilled over the tops of the sails, so this acts as an automatic way to counteract the effects of sudden strong gusts of wind. 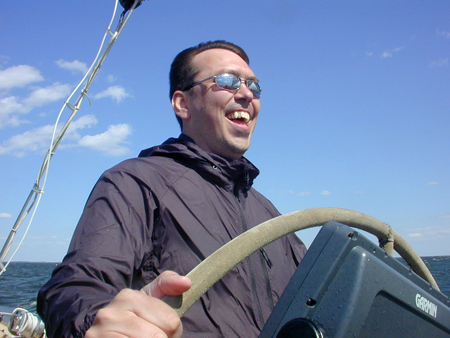 Lots of wind, on a properly sailed and balanced boat, means lots of fun. I can’t tell. Was Steve enjoying himself? 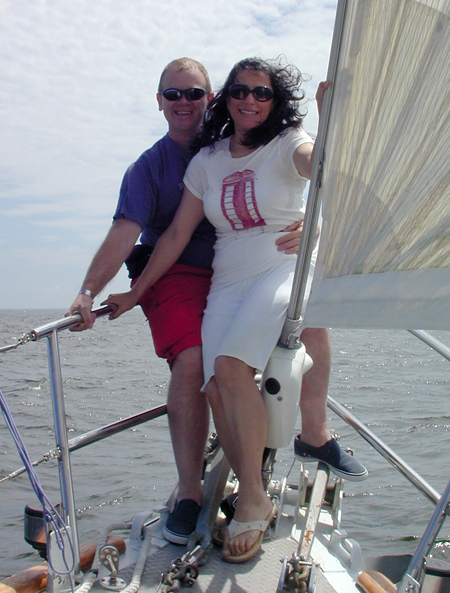 And even bundled up, sailing can be quite the romantic affair! Steve and Lara… they’re under all those layers somewhere. Now, with all the motion and action, did anyone begin to feel queasy? Nothing worth mentioning!!! And this photo was definitely not staged. There was really something very important out there on the water. 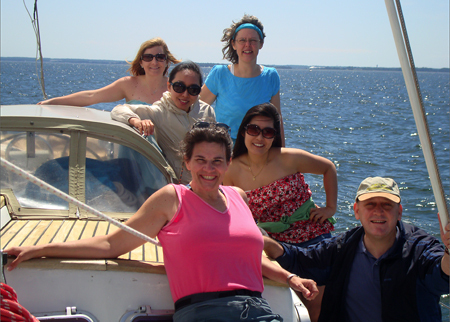 All in all, a great sail on the water with some great folks who loved the raw energy of the day. Another wonderful day for Schooner Heron Charters. 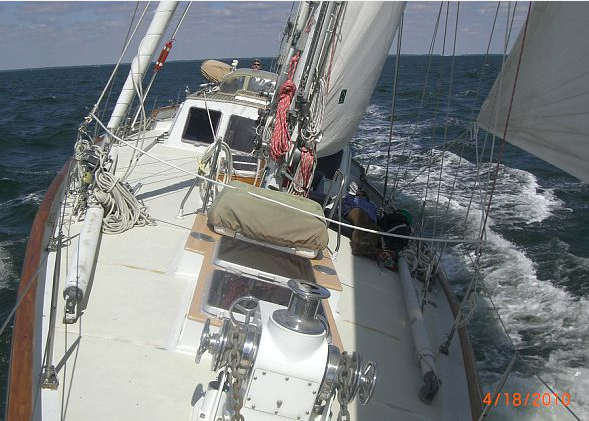 Schooner Heron Charters had its first charter of the season on April 18th. 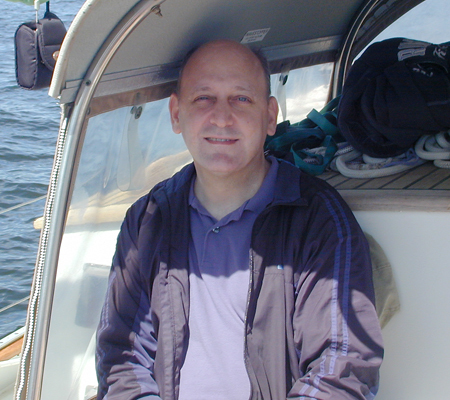 With 20+ knots of wind blowing from the NW, and temperatures in the 50’s, it was a pretty chilly day out on the water. 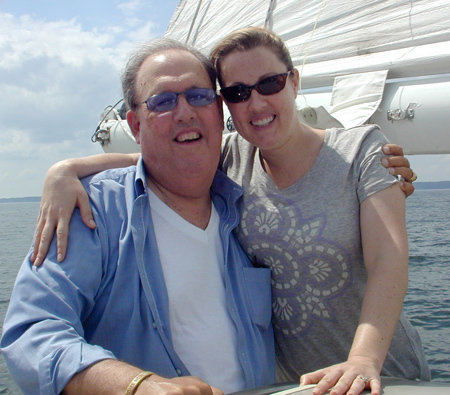 But the John McManus family from Bethesda, including wife Barbara, and kids Justin, Jessica, and Jack, made their way south to take the first charter of the season on Schooner Heron. They came well prepared for the chilly weather with jackets, gloves, hats, long underwear: surely this is a family that knows how to have a good time outside, year round. 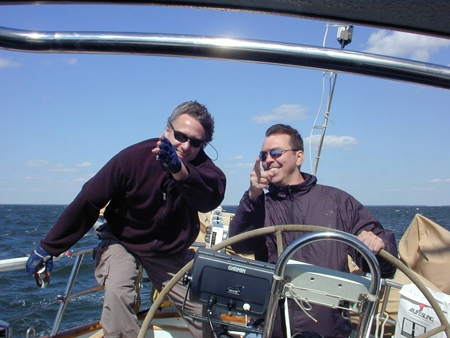 John was at the helm most of the day, with Jack, 11 years old, taking the helm several times. John, a powerboat owner, had a little bit of the sailing convert in his eyes, when a puff would hit and Schooner Heron would heel over. And little Jack, well, he was amazing. Pure concentration! 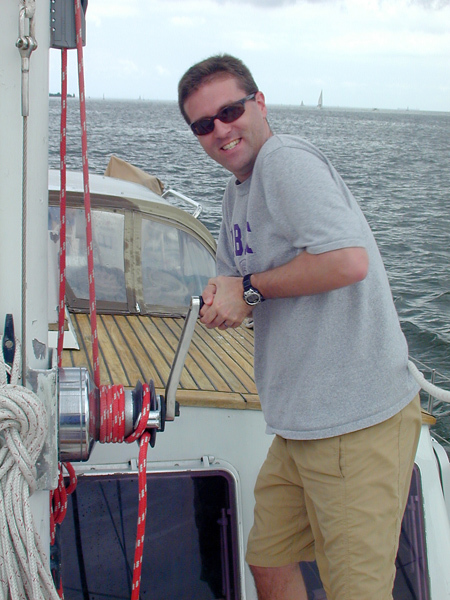 He steered better than some of my friends who have been sailing with me for over a decade. 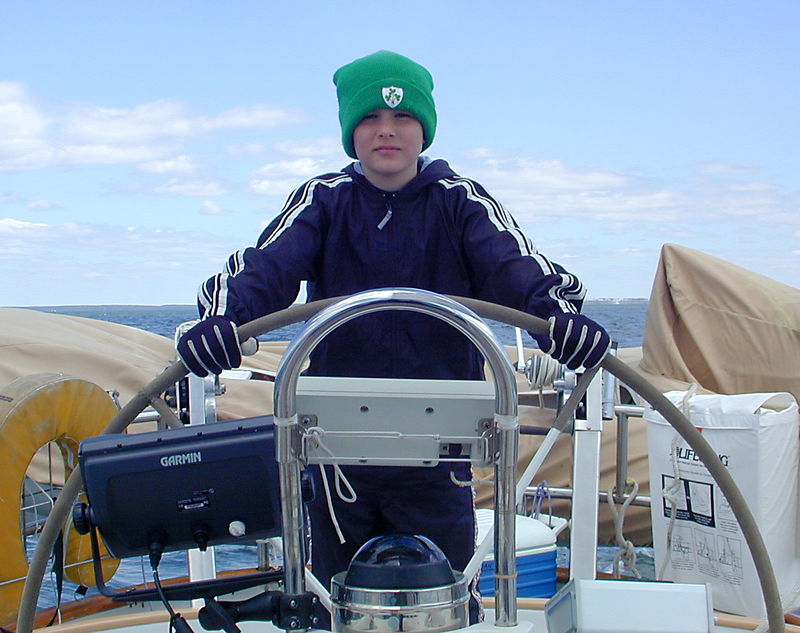 And how many 11-year olds can tell their friends they steered a 44,000 pound boat in small craft advisory conditions. 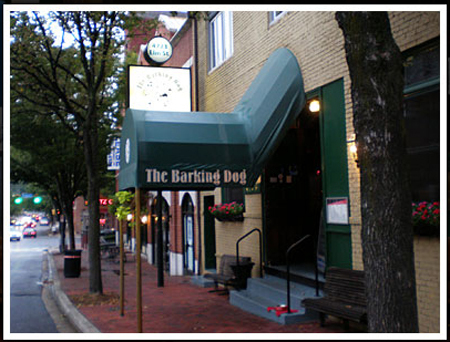 John is owner of The Barking Dog Bar and Restaurant in Bethesda, and from the sound of it, that’s where I’m going, next time I’m in the area. 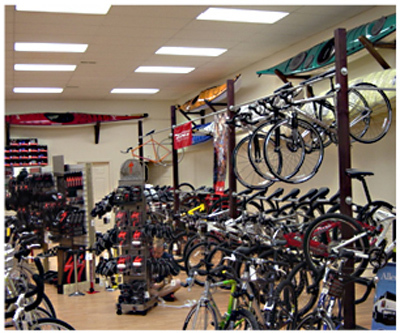 It’s located at 4723 Elm Street, in Bethesda, and their phone is 301-654-0022. This place sounds great. They do it all. It can be your local pub, they can cater your large party… great happy hours! Send an email to them for more information, and when you’re there, lift a pint to the McManus family for being a bunch of gritty sailors who gave me a great first charter for 2010. 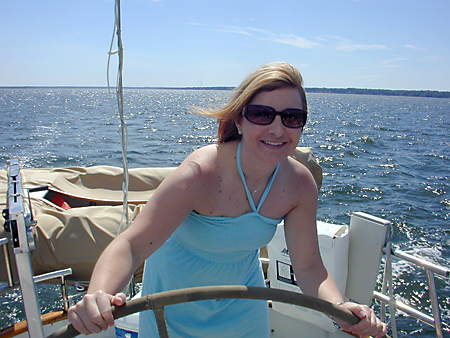 And come on down to Solomons Island for a great recreational escape, and take a daysail on Schooner Heron. 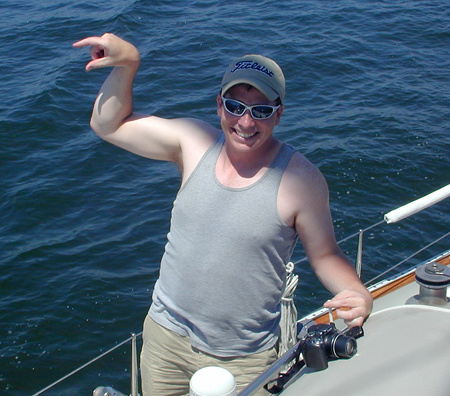 At Schooner Heron Charters, we’ve had our first charter of the season on April 18th. It was a blustery but very exciting day with a wonderful family from Bethesda. Please see our post above, and check out our website, and come on down to Southern Maryland for a great recreational visit. And while you’re here, book a charter on Schooner Heron and have the time of your life! Once again, thanks to our local Tourism Specialist at the Department of Tourism in Calvert County, Joyce Baki, we have the latest and greatest in what’s going on in Calvert County this month and next. Questions about events and special activities, call Joyce at 410-535-4583. On Friday, April 23, the Calvert Marine Museum and the Leagues of Women Voters of Calvert and St. Mary’s Counties invite you to explore To the Last Drop: Our Looming Fresh Water Crisis. 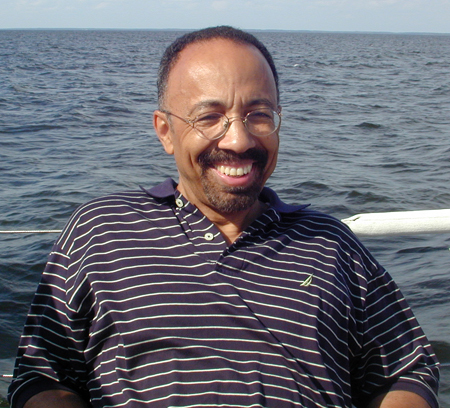 Dr. Robert Summers, Deputy Secretary of the Maryland Department of the Environment will deliver the keynote address. A panel discussion, posters and displays will also be available. 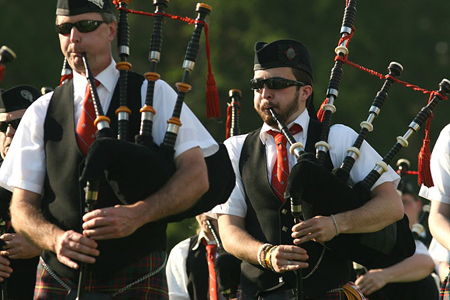 The 32nd Annual Celtic Festival of Southern Maryland will be held on Saturday, April 24. It is the oldest Celtic celebration in Maryland, highlighting the heritage of the Scots, Irish, Welsh, Manx, Breton, Cornish and British. More than 50 clans and societies will have information to share. Three performing stages offer continuous music and dance featuring internationally known recording artists and groups. Enjoy craft and country dance demonstrations. Listen to storytellers weave their tales while harp and Scottish fiddlers play in the background. competitions will occur throughout the day including pipers, fiddlers, highland dancers, athletes, drummers, pipe bands and Celtic harpers. After closing ceremonies, there will be an evening ceili. Saturday, April 24, American Chestnut Land Trust hosts two guided hikes. A leisurely guided walk along Gravatt East will allow you to view wildflowers and early migratory birds. Bring binoculars and meet at 9 a.m. sharp at the south side trailhead barn off Scientists’ Cliff road. The hike will be held rain or shine, unless thunderstorms occur. At 10 a.m. bring the kids and enjoy a guided hike along the south side trails. The hike will last approximately two hours. For information or to register for an event at ACLT visit the website or call 410-414-3400. 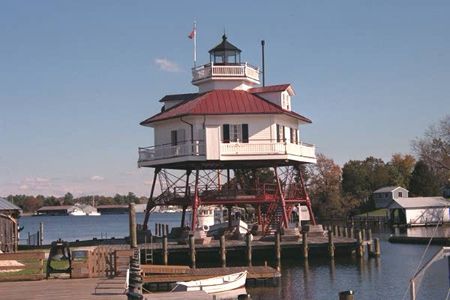 Celebrate Southern Maryland traditions at the Calvert Marine Museum’s Annual Maritime Festival on Saturday, May 1. 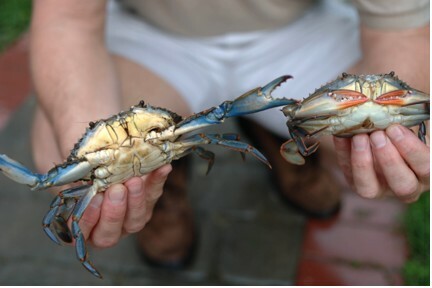 Taste traditional foods, learn how to pick crabs and shuck oysters like the pros. Enjoy local gospel and old time music. See world-class water fowl carving and the Chesapeake Bay retriever trails in action. Watch model boats skim the waters of the boat basin and talk with traditional crafts people as they demonstrate their skills. Kids will enjoy traditional games, races, toy boat building and more. And, as we said, visit the website for Calvert County Dept. 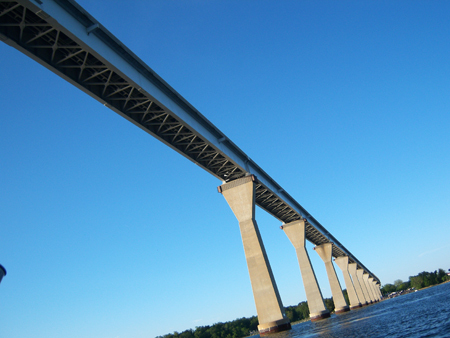 of Tourism for more great events happening in Calvert County. It was a snowy and cold winter… no need to tell anyone that. The cold and wetness put off maintenance and projects on Schooner Heron, so I’m rushing to get things done before our charter season opening on April 16th. Projects for this spring include re-routing the main engine exhaust hose to prevent hydrolocking. 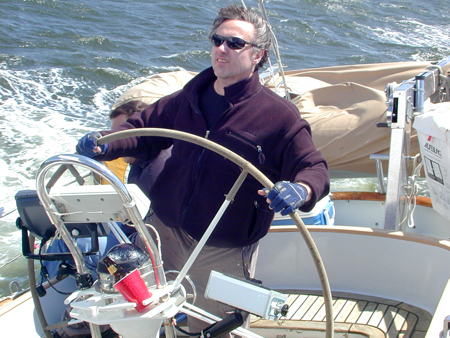 This happened to us about 60 miles offhsore in sporty conditions when we made a quick September, 2009 trip to Block Island. Hydrolocking occurs when water is able to back up through the exhaust hose and enter the engine cylinders, preventing the pistons from moving. You can’t compress water! But the initial symptoms can be confused with other problems. When you turn the key, you hear a clunk, then nothing… so, perhaps a dead battery? Corroded connections? 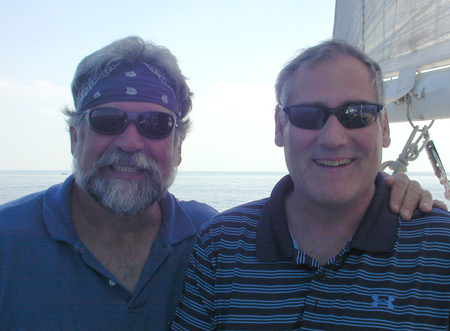 But my good friend and master mariner Karl Westby, aboard for the trip, diagnosed it properly. My 100 hp 2-stroke Detroit was hydrolocked. We were sailors, without an engine. No worries. We had plenty of wind. Anyway, back to the project, the cure is to put a raised loop in the exhaust line to prevent siphoning. Sounds easy, but when you’re working with 4″ rigid exhaust hose, and need to find room for the loop in very tight quarters with an aluminum infrastructure, it can get trying. I completed this job, after a lot of grunting and groaning and lots of cuts to the hands and arms, about two weeks ago. Maintenance also includes new varnish for the toerails, oil for the teak in the cockpit and on top of the pilothouse… some electrical work, some plumbing… and LOTS of cleaning. We even need to bend on two more sails which have been plumped in a pile in a bedroom for the winter. We’ll be ready, and our first booked charter is April 18th, the Sunday of the Tiki Bar opening, and the second day of the rockfish season opening weekend. It’s going to be crowded out there on the Bay!